As part of a Hackathon organised by Beyond hackers were presented with challenges that Henry Street Settlement faces internally in terms of managing their staff and their services among various stakeholders. My team The Henry Street Helpers took the challenge to hack for creating a better gift registry system so that Henry Street can streamline their annual Joy Drive that allows donors to give holiday gifts to Henry Street Settlement's participants. Our team– The Henry Street Helpers were the First prize winners at the Hackathon. 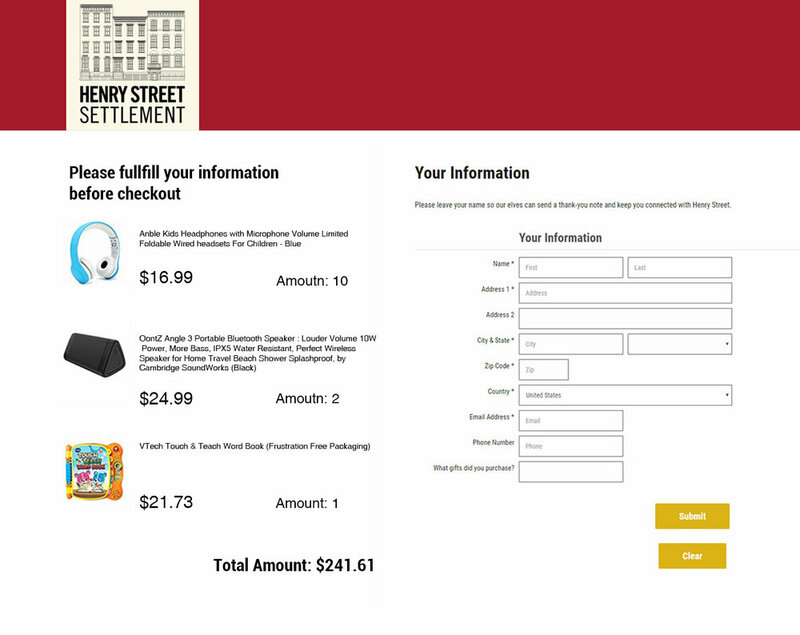 The current gift registry system for Henry Street Settlement is complicated and requires extra effort for the staff at Henry Street to consolidate all the data from 14 different sites, put it on the Amazon Wishlist and wait until all the gifts arrive before distributing to 14 sites manually. This gift registry is managed by only two coordinators and currently requires more man power during the holiday season to solve for the issue. 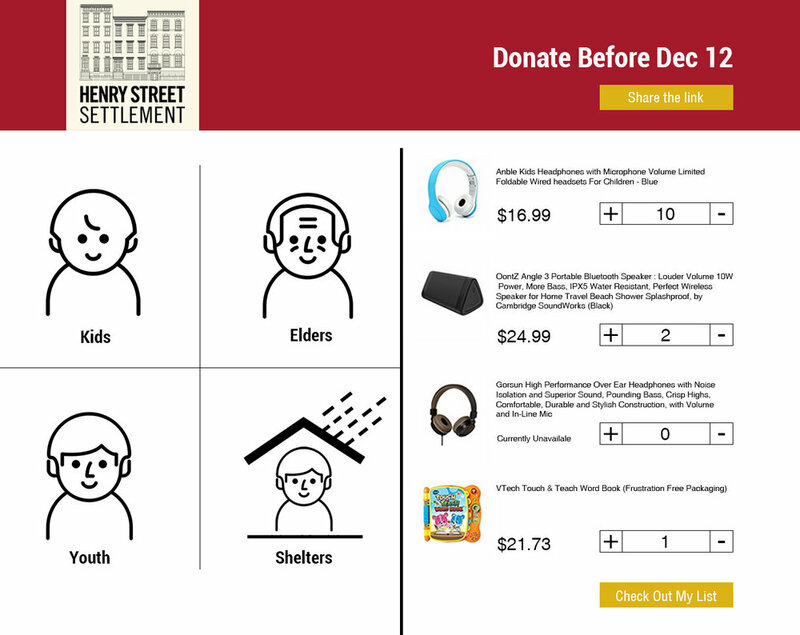 On the donor's end the current system is pretty simple as they will be redirected to the amazon wish list purchase a gift and the gift gets delivered to Henry Street Settlement. 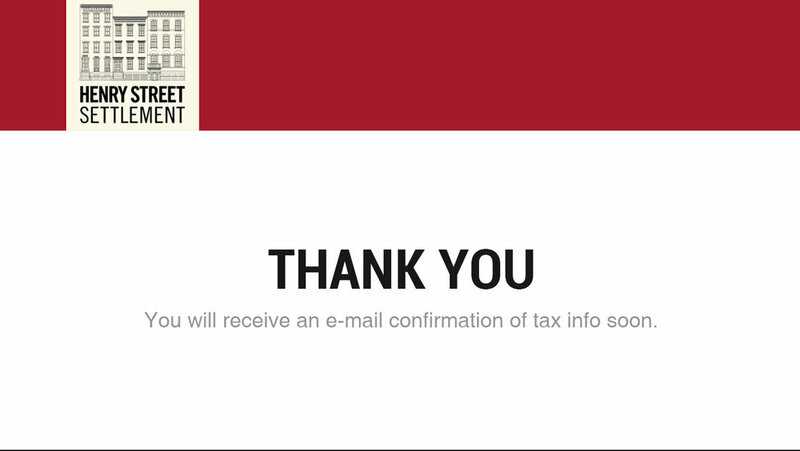 The donors then receive tax information via email. After interviewing Henry Street– some primary concerns that Henry Street had was that the donors must feel that they are making the donation and did not want to tweak that experience, the experience could be in the form of donating cash as well without having to buy a particular gift from the Amazon Wishlist. Henry Street wanted to be in charge of when and where the gifts get delivered and also wanted a system where in they could receive money rather than have actual gifts mailed to them without using any third party company. How might we help Henry Street better organise their holiday gift registry system? The solution created is for Henry Street to have their own gift registry system that the managers can update as and when they want to order a gift. This registry system will be hosted online for donors to navigate and donate for Henry Street. The registry system is connected with the Amazon API that will help the managers to order gifts and also helps donors to donate the gifts. Based on research, if this product is designed and the service were to be implemented, the time spent on the gift delivery system would be reduced from 18 hours a week to 2 hours a week per person, increasing the staff bandwidth to focus on other mission driven projects at Henry Street Settlement. 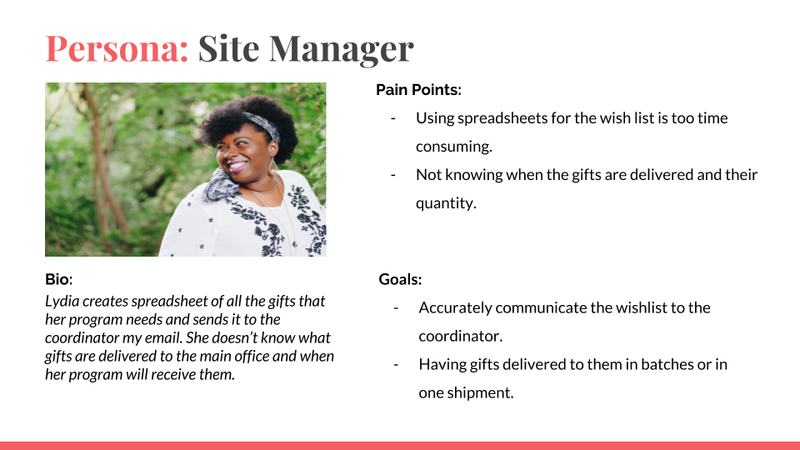 The coordinator maintains the registry and manages the gift wishlist. The coordinator can track goals of their target for the year. The managers from the 14 different sites of Henry Street log in gifts as per requirement from each site that the coordinator tracks and manages. Both the coordinators and managers have access to the dashboard. The only difference is that the coordinator submits all the gift requirements to the website and has the power to edit and make changes to the list and also track goals. While the mangers can only submit entries of the gifts onto the dashboard.